This article was originally published with incorrect p-values in figures 2 and 6. The revised figures are shown below and have been corrected in the article itself. The authors apologise for this error. 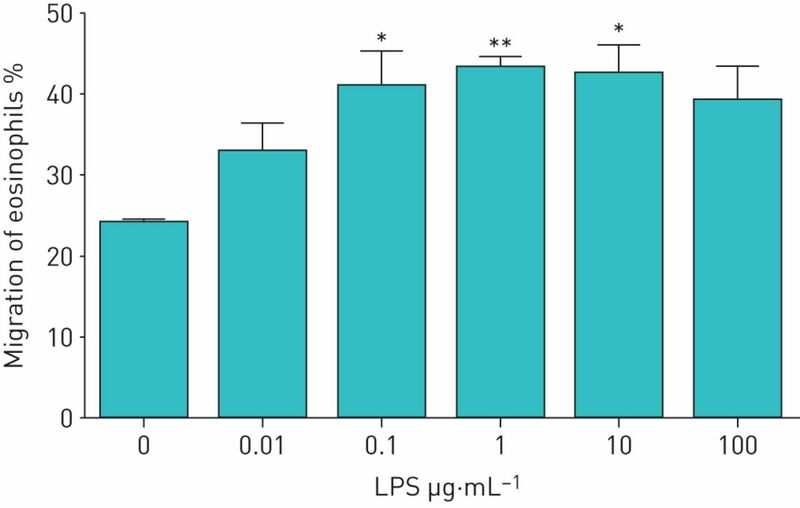 Dose-dependent effect of lipopolysaccharide (LPS) on neutrophil-induced trans-basement membrane migration of eosinophils in healthy volunteers. Neutrophils (2×104 cells) were stimulated with various concentrations of LPS (0.01–100 µg·mL−1) and then placed into the lower compartment. Eosinophils (1×105 cells) were added to the upper compartment of a chamber with a Matrigel-coated Transwell insert. After 120 min of incubation, migrated eosinophils in the lower chamber were measured by eosinophil peroxidase assays (n=4). Data are presented as mean±sem. **: p<0.01 versus spontaneous migration (0 µg·mL−1 LPS) by Tukey test; ***: p<0.001 versus spontaneous migration (0 µg·mL−1 LPS) by Tukey test. 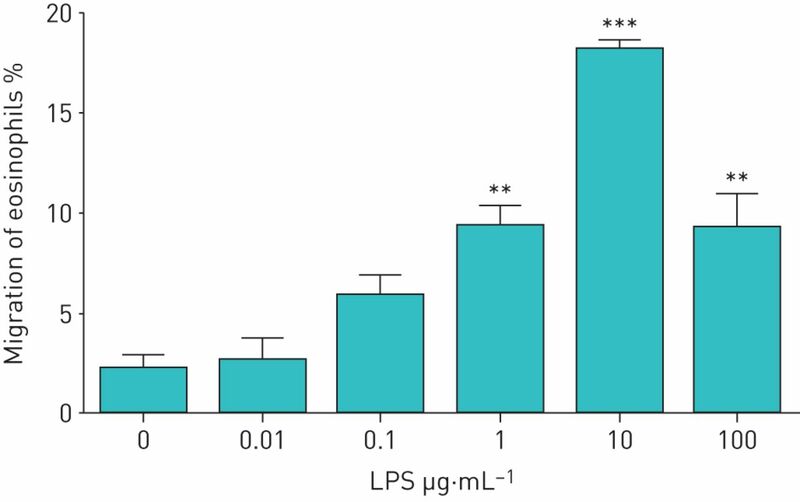 Dose-dependent effect of lipopolysaccharide (LPS) on neutrophil-induced trans-basement membrane migration of eosinophils in severe asthmatics. Neutrophils (2×104 cells) from severe asthmatics were stimulated with various concentrations of LPS (0.01–100 µg·mL−1), and then placed into the lower compartment of a chamber with a Matrigel-coated Transwell insert. Eosinophils (1×105 cells) from severe asthmatics were added to the upper compartment. After 120 min of incubation, migrated eosinophils in the lower chamber were measured by eosinophil peroxidase assays (n=4). Data are presented as mean±sem. *: p<0.05 versus spontaneous migration (0 µg·mL−1 LPS) by Tukey test; **: p<0.01 versus spontaneous migration (0 µg·mL−1 LPS) by Tukey test.